launched during my pregnancy (I actually travelled to Amsterdam for the press preview of the Day 2 while 20 weeks pregnant), I decided to play the long game and was sold on the Geo. I'm not planning on a playmate for Georgie any time soon but it's good to know that it will morph into a two-(mini) man solution when and if the time comes! Ours is Graphite from the Studio collection which comes with the diamond double stitching, a sleek silver chassis and black leather handlebars. I was in two minds as to whether to buy some sort of downstairs sleeping pod for the then unborn baby when my mum mentioned that she used the pram downstairs in the day when I was tiny. It made perfect sense, we could wheel her around to get her to sleep and rock her at the table when we were eating. And we did, lots! The pram is where she lived for most of the first six weeks. An added bonus to this was if we did need to nip out there was no waking a sleeping baby, we just slung on a cosy blanket slipped on a hat (oh...so...gently) and we were good to go. The inside of the pram mesmerised her, the diamond stitch design is perfect for a newborn as they can only see high contrast at very close proximity at first. That and the Christmas tree lights which we regularly parked her beneath. There's also a mesh section at the back when you pull up the canopy which is good for air flow in summer and peeping in winter! We're not using it so much indoors now, for two reasons; a) now that I'm out and about it's in the boot and I can't be bothered to bring it indoors and b) she now likes to spread out like a star when she's sleeping so we've popped up the travel cot in the kitchen to give her more room to spread out in the day! The pram fits into the boot of my car (a very old BMW) if I remove the wheels, easily done but I usually just unclip the bassinet and put it on the back seats next to her car seat. She still sleeps beautifully in her pram when we're out and I do wonder if it has something to do with the fact that she's been used to sleeping in it lots from birth. Maybe. We opted not to add on the car seat that clips onto the pram frame (Joolz make one and other brands are compatible too) because the temptation to leave her in it would be too great! It's recommended that they are in the car seat for the shortest time possible so I didn't want to leave the option open for myself. She transfers quite well from one to the other and usually goes back to sleep quite quickly if she does wake up. So, about taking it out and about. 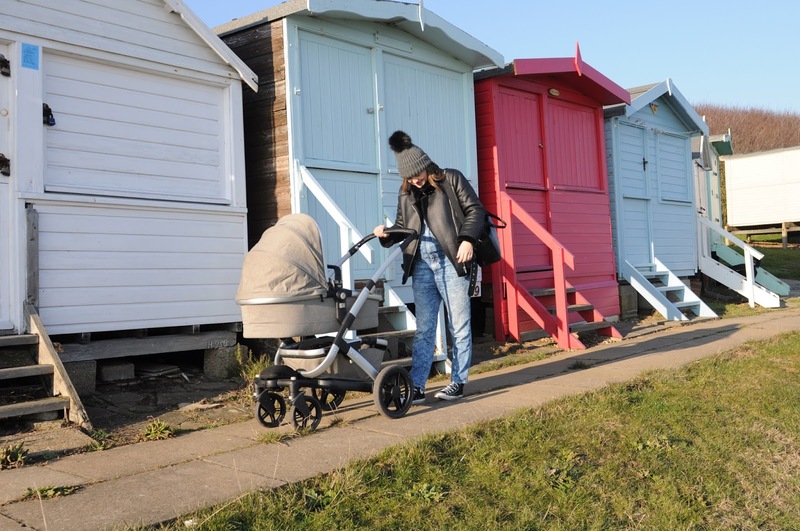 I get so many compliments on the pram and the light coloured fabric, especially refreshing during the dark winter months, it certainly draws attention in a line up of parked black and blue chariots at the buggy park. The black leather handle is as soft and stylish as it is wipe clean! It's a pleasure to push, can be gripped easily and doesn't get too cold. The large basket underneath is really handy for picking up shopping or storing extra clothing layers/blankets. The Geo is a really sturdy model which is important as I have an irrational fear that she might blow away in a strong wind or go hurtling down a hill as I let go for a second. It's quite slim and fits through most doorways without trouble. The handlebar is adjustable to any height with very small increment increases so Tom's (6"1) is as able to push it with as straight a back as my 93 year old Nan who is about five feet tall. The handling is very light and can be manoeuvred easily with one hand, which is useful for getting through doorways/eating chocolate bars. It hops up and down kerbs easily by levering on the bar at the bottom and for larger steps there's a handle across the centre to lift it up. I can lift it up three or four steps entirely unaided, for more steps there is a bar at the bottom for someone else to help lift with. The Geo is as good for pavement pounding as it is off road, it even handled easily on the beach, although I haven't tried it on dry sand. With a quick click, the two front wheels lock into place which makes it much easier to handle on rough terrain, sand or cobbled streets. The rain cover is easy to put on and is stored in a pouch at the centre of the front wheels. 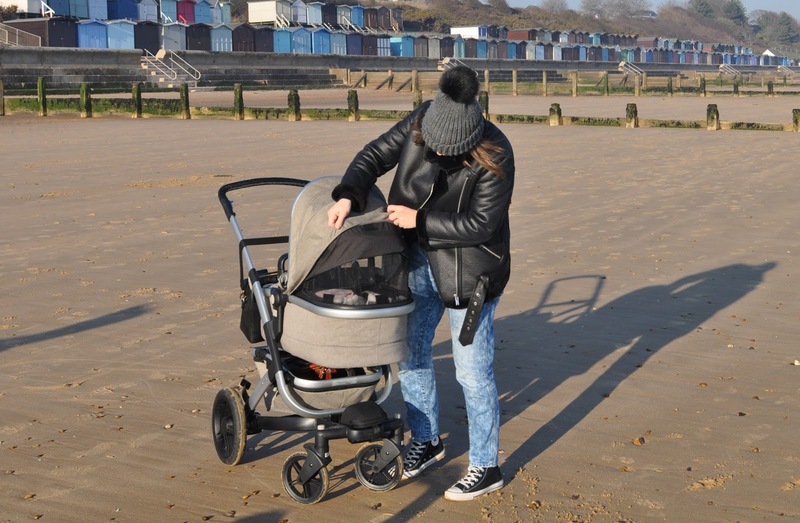 My love affair with the Joolz Geo is already into its eighth week and I'm struggling to find any downsides but as I am so worried about the pram being stolen it would help if it was easier to loop the lock through the bassinet part of the pram. Tom has suggested popping a wheel of and taking it into baby clubs with me, I'm reluctant to do this because I'm sure I'd come across as completely crazy. But nice to know it's an option! Little legs will be in the bassinet for another four months then the fabric parts zips off and the Geo reinvents itself as a pushchair which she'll ride in for a long time to come. I'm not ready to even think about her being big enough for the big girls pushchair yet but I'll report back when it's had its makeover! 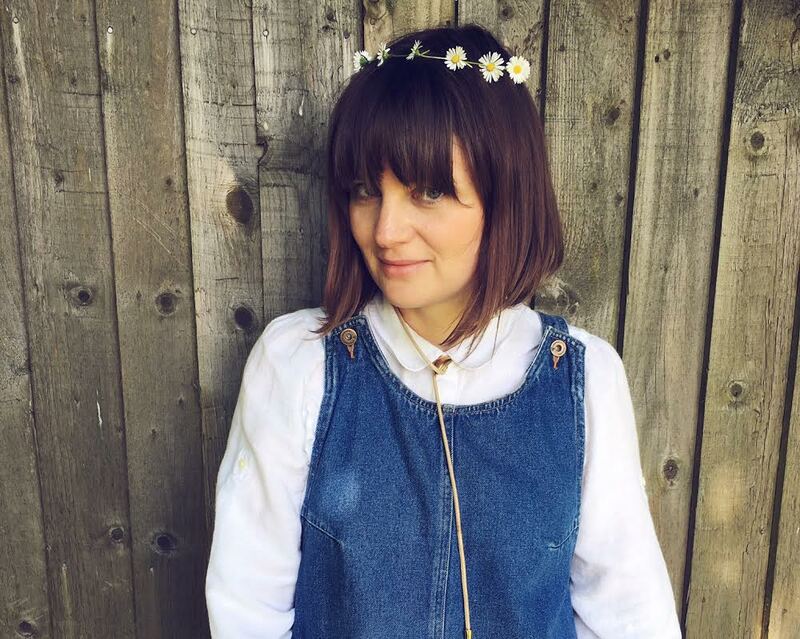 We have the Joolz Geo in Graphite from the Studio collection. Find out more here.